Pour raw (or pre-roasted, if you prefer) almonds in a food processor. Turn on food processor and keep running for 15-20 minutes, scraping down sides of the bowl occasionally, until almonds turn into a creamy, spreadable paste. Add salt, honey or other ingredients if desired and stir to incorporate. Transfer butter to a storage container and store in the fridge. I almost feel weird even calling this a recipe. There is one ingredient. One. Uno. However they say “one” in French. And yet, this singular-ingredient creation is a recipe indeed. For what, you ask? Homemade Almond Butter, of course. OK, not of course. I wouldn’t have expected you to guess that. Because I don’t know about you, but until very recently, I though nut butters (like peanut butter, duh) were always made with multiple ingredients. Sure, the stuff you buy at the grocery store IS made with multiple ingredients, like salt and sugar and oil. But did you know that none of that extra stuff is necessary? And that pretty much any nut in the world, with a little bit of patience, can be transformed into a creamy, spreadable butter? True story. 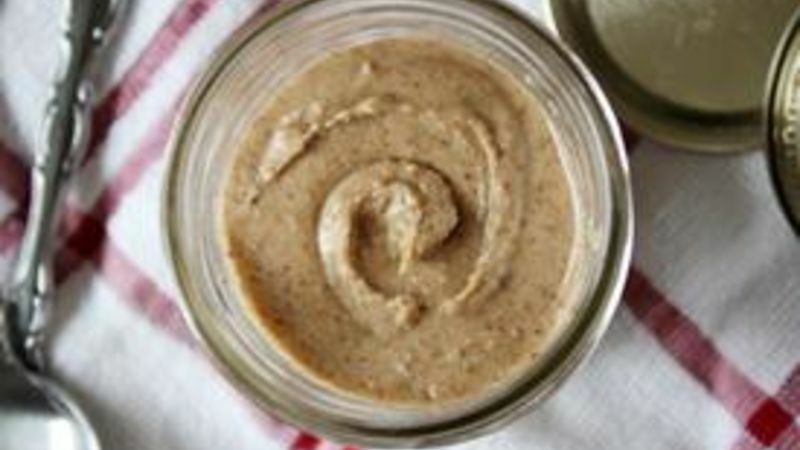 One of my favorite homemade nut butters is this one made plainly with almonds. You can also roast the almonds before you grind them, or mix them with cashews, or drizzle in some honey, or sprinkle in some salt… the possibilities are mindbogglingly endless. Let’s get started, shall we? First, grab a cup or so of whole, raw almonds. Pour those almonds into a food processor and start, well, processing. Pretty soon, those whole almonds will turn into a coarse mess, like this. Scrape down the sides of the bowl every once in a while and keep at it. After about 15 minutes and occasional scraping, the coarse mess will turn into a creamy, spreadable buttah. Just like this. Now spread that stuff on anything and everything – bread, muffins, oatmeal, your dog, your cat – whatever. It’s delicious and nut-tritious (get it? Get it? Yep).